I call myself a blacksmith because that is where my main focus has been for more than 40 years. I do enjoy and practice other forms of metalwork as well as traditional woodworking and pottery but the forge is always where I end up whenever I have any spare time. I grew up with a craftsman mentality. Everyone in our family made things either through necessity or for enjoyment and I learned how to work through problems and how to use hand tools at a very early age. My interest in becoming a blacksmith started when I realized the he was responsible for making all the tools for everyone else. That was the ﬁrst piece of the puzzle I was working on at that time. By becoming a blacksmith I was no longer going to have to spend all my time looking for tools, I was going to be able to make any of the tools I needed for all of the other trades I was interested in. I had found my passion and I never really considered doing anything else. My focus was so complete that it took me over 35 years to realize that I had no way of earning a decent living. 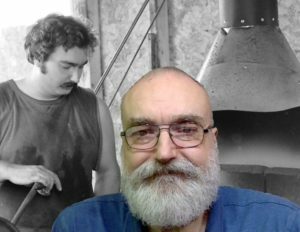 In 1979 my parents gave me permission to set up my ﬁrst forge in our back yard and that was the ofﬁcial start of a journey that continues to this day. I have many people to thank for getting me started but I am largely self-taught. I can’t claim to have any real formal training or education – none was available. Also no one really understood what I was trying to do because I wanted to know how to work with a technology that ended with the industrial revolution. I quickly found out that the people I really needed to talk to had been dead for 200 years or more. Having no other recourse given the resources available at the time, I began to spend hours experimenting with different ideas in order to try to gain a working knowledge into a way of thinking and working that few people understand or even care about anymore.